SDQ Interview with Paul Acampora. 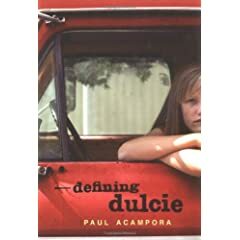 Another YA author with fine, fine musical taste, Paul Acampora is the author of Defining Dulcie. Read this interview, then read his fine, fine book. I loved the Black Stallion books when I was a kid. I think I read every book Walter Farley ever wrote. My eleven year-old son discovered the books and the movies (which I didn’t even know about) recently. I’m having a good time walking down this path again. I find her work as frightening as it is beautiful. She gives her whole heart to every word. It’s like watching a great actress completely throw herself into the role of Lady Macbeth. I always wonder if she can be sane again when the show is over. I grew up a couple miles away from Lake Compounce, the oldest amusement park in America. It was a run down dirty old park back then but always such a fascinating and fun and frightening place. I’m told it’s a much cleaner, more family friendly destination these days. That’s probably for the better. Unless you want to grow up to tell stories about it. We recently adopted a two year old Golden Retriever. He is doing a really nice job of training us. A Walk through Durham Township, Pennsylvania. The photos here so often completely capture a sense of place. Plus they really have a sort of voice. I love writing that really gets those two things - voice and a sense of place – just right. Seeing it happen in a completely different medium is remarkable. A kids tv show called "Jakers: The Adventures of Piggly Winks" which I watch with my kids and then we walk around speaking with bad Irish brogues for several hours. Also, it has Mel Brooks doing the voice of a sheep. It cracks me up. In a separate guilty pleasure: I dog ear books. I write in them too. Those rabbits with red eyes. Again from my growing up years when my parents would take us to the Naugatuck Mall for pizza and an ice cream cone on a Friday night. For some reason, I thought they said Naugahyde not Naugatuck. I could never figure out why they named the place after a kind of plastic leather. Many Friday nights, I strolled the Naugahyde Mall -- hand in hand with my sister and parents -- looking for the Naugahyde Store. Never found it. Even when I have to sit on it today, I still associate the word with good things though. Yet another challenge, this time with an exciting twist!